The talk will take place this coming Thursday, the 27th February at 1730, at the Environmental Research Institute, Castle Street. Excavations at Minehowe, an enigmatic site on the Orkney Mainland, have recovered rich bioarchaeological assemblages including carbonised plant remains, land and marine molluscs and mammal, bird and fish bone, dating from the 3rd century BC to the fourth-fifth centuries AD. 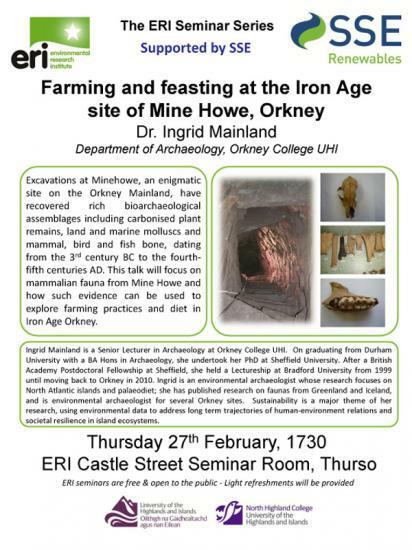 This talk will focus on mammalian fauna from Mine Howe and how such evidence can be used to explore farming practices and diet in Iron Age Orkney. Ingrid Mainland is a Senior Lecturer in Archaeology at Orkney College UHI. On graduating from Durham University with a BA Hons in Archaeology, she undertook her PhD at Sheffield University. After a British Academy Postdoctoral Fellowship at Sheffield, she held a Lectureship at Bradford University from 1999 until moving back to Orkney in 2010. Ingrid is an environmental archaeologist whose research focuses on North Atlantic islands and palaeodiet; she has published research on faunas from Greenland and Iceland, and is environmental archaeologist for several Orkney sites. Sustainability is a major theme of her research, using environmental data to address long term trajectories of human-environment relations and societal resilience in island ecosystems. Doors open at 1715 – all ERI Seminars are free and open to all. Light refreshments will be available. The ERI Seminar series is supported by SSE Renewables. We are delighted to invite you to our next external seminar, being held on Thursday 23rd August. Environmental Research Institute (ERI), Thurso have two speakers, Alam Sarawar and Sayam Chowdhury who will be talking about "Saving Critically Endangered birds in Bangladesh." The presentation will be held in the ERI seminar room, Castle Street in Thurso - doors open at 5.15pm. The talk will be TUESDAY 7th of April, at 17:30 at the Environmental Research Institute, Castle street, Thurso. Dr.